Rockstar Games has begun a sweeping series of actions targeting Grand Theft Auto Online cheaters. Numerous players who used mods or glitches for extra in-game cash have seen their in-game bank accounts reset to $0 (plus any in-game money purchased legitimately via Shark Cards). Affected players are also receiving messages from Rockstar stating "we have determined that your account illegitimately gained in-game money via mods, cheats, or other actions. We've adjusted your account and updated your balance." Resets are going out in waves, with higher-balance bank accounts being targeted first. The resets come immediately after Rockstar altered its suspension policy: suspended players will now have their in-game progress and inventory reset, and players who continue to cheat after suspensions will be permanently banned. Suspensions or bans can be incurred in a variety of ways, including "modding in GTA Online, exploiting or abusing game mechanics, manipulating protected game data and code, or interfering with other players’ gameplay experience;" single-player mods will not trigger bans. Grand Theft Auto Online has been beset by cheaters since its PC launch in April 2015, with many taking advantage of the game's lack of dedicated servers to gain extra XP, in-game money, or items. 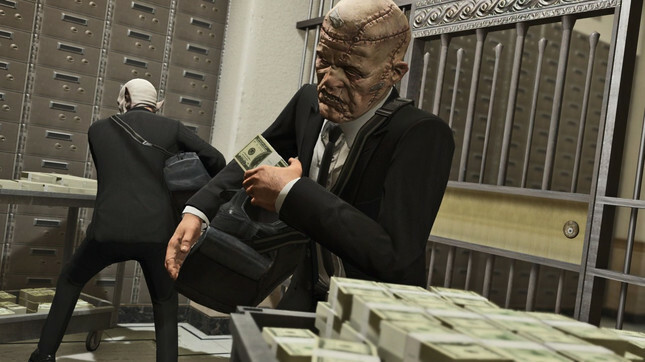 Rockstar says the account resets and suspensions are designed "to keep the gameplay environment fair," but neglects to mention the additional goal of preventing piracy of in-game cash, which Rockstar sells via microtransactions. The GTA Online marketplace is currently valued at over half a billion US dollars.